Shirts With Random Triangles: USC AD Pat Haden To Step Down In June. Haden had been dealing with health-related issues during the 2015 season, and had recently stepped down from his role as a member of the College Football Playoff Selection Committee. 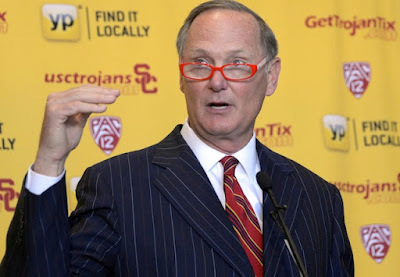 Haden led the Trojans athletic program through a tumultuous 5½ year period, which saw the football program banhammered by the NCAA for the school's involvement in the Reggie Bush scandal. The school was banned from post-season bowls, lost a significant number of scholarships, and was forced to forfeit its 2004 BCS title. The rest of Haden's tenure wasn't a picnic on the football front, either. On Sept. 29, 2013, Haden infamously ordered then USC head coach Lane Kiffin off the team bus and firing him after when Trojans arrived back to Los Angeles following a 62-41 loss to Arizona State. Haden hired former Washington head coach Steve Sarkisian in December of 2013 as Kiffin's replacement. Sarkisian went 12-6 at USC before being fired n October of 2015 due to alleged substance abuse related issues. Haden will oversee the renovating of Los Angeles Memorial Coliseum following his departure from the USC athletic department.